This picture is from my house -- not from the golf course. I'm sharing it as a reminder to use caution during dry periods like the one we are experiencing, check your fire extinguishers, and be prepared. Living in Illinois, we don't often think about outdoor fire dangers like they do in western states but it is a concern during drought periods. After I got home from work yesterday, the electrical box in the bushes in front of my house sparked and set off a small fire. Luckily, a neighbor saw the smoke immediately and rang my doorbell. (Thanks, Jeff!) It travelled this far in the less than 30 seconds it took us to grab our fire extinguishers. I don't know of any official bans in our area, but many counties and cities in Illinois have recently issued bans on fireworks, recreational fires, or charcoal grills. After experiencing how fast a fire like this can spread and how hot they are, I can see why. Northern Illinois has been very dry for the entire first half of the year. Here at Sugar Creek Golf Course, we have had only a 1/2 inch of rain in June so far. Combined with days of very low humidity and high wind, the soil is as dry as we've ever seen it. It has kept us busy in the maintenance department trying to relieve the stress on the turf through hand-watering and targeted irrigation. For us this is good news after the last 3 years of excessive rainfall. Dry rough! It's beautiful! Why do I say that? I have not seen this area dry out since 2007, but I also haven't seen the fairways as firm and consistently playable either. Areas of rough that are out of play and at the margins of the irrigation system should be dormant in a drought. It is only natural and indicates that playing conditions are probably outstanding where it counts. The course is weathering the drought thanks to some great root growth this spring. We are glad this drought didn't come after the cool, wet, rootless springs of 2010 and 2011. We could certainly use some rain soon, but the course is holding up well to the dry conditions. The 7th fairway in the shot above is healthier than it has been in a long time after the many projects and aerifications we have given it in the past two years. The new sand trap in front of #8 is functioning well so far. Thankfully it has yet to be tested by too many thunderstorms. It did handle a rain event over an inch in May with zero puddles. It looks like this dry period is going to get a little worse before it gets better, but we are looking at the bright side of things. Too dry is much better than too wet! Just like turf, trees appreciate good drainage. The pictures below show the effect of even a small difference in drainage. The two trees were planted 50 feet apart. 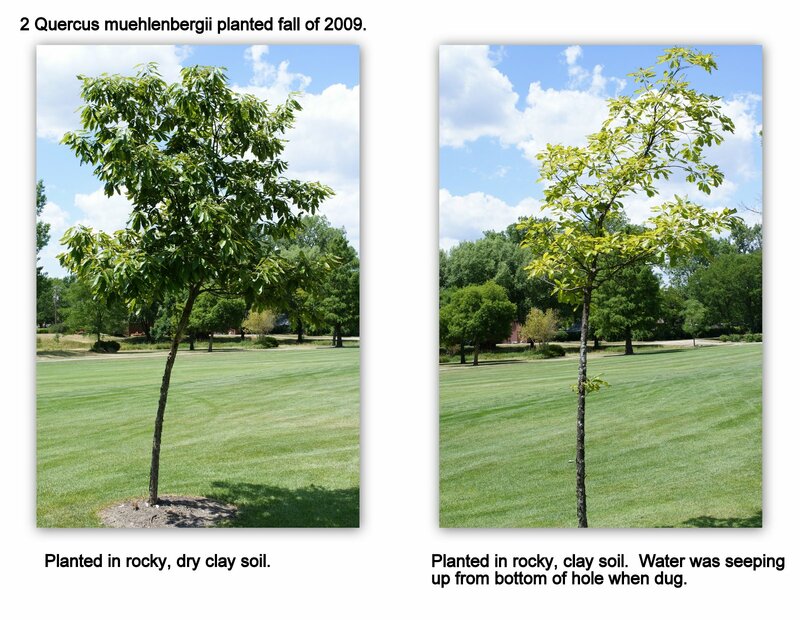 The tree on the left was planted in rocky clay soil. Not very good soil, but it was dry. That tree is thriving. When we dug the hole for the tree on the right, I remember a trickle of water coming up from the bottom. After the tree was planted, we ran a drain line near it that I was hoping would help. This dry year might actually do it some good. The tree on the right might still make it, but the tree on the left is clearly more healthy.